We didn’t even know she had a loose tooth. Had it been her older sister, we’d have been talking of nothing else for days, but no, that’s not the way it works. She’d said nothing until dinner last night, when I asked about her day. “I lost my tooth!” she said. Her tongue probed the empty space where the molar had been. I looked at Luau, who shrugged in confirmation. She told me. After the fact, but she told me. I mean, holy hell, she TOLD me, But how did I not know that my kid’s MOLAR was loose? “And I will put it under my pillow because the Tooth Fairy will come and turn it into a prize!” she said. Luau and I glanced at each other, panicked. We didn’t know the tooth was loose. We didn’t have a ‘prize’ to offer. I looked around the kitchen, searching for inspiration. I thought of the Halloween stickers that I’d almost bought for her on a whim earlier in the day. Damn it. We tried to explain that perhaps the tooth fairy would bring money for her so that she could buy a prize for herself. She wasn’t having it. Money doesn’t mean anything to her. The Tooth Fairy wouldn’t bring something that had no meaning for her. Katie jumped in to say that she had spoken with the Tooth Fairy and she’d said that she was all out of toys. She still wasn’t having it. Somehow, some way, she was convinced that the Tooth Fairy would come through. And why wouldn’t she? She’s magical, after all. 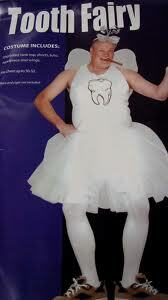 The Tooth Fairy. My kid believes in the Tooth Fairy. She gets the idea that she puts her tooth beneath her pillow and something magical happens. The kid who didn’t seem to get Christmas, who couldn’t tell me what she wanted for her birthday, THAT kid believes that the Tooth Fairy is going to come and get her tooth and leave her something in its place. The Tooth Fairy was not going to let her down. I drew up a note and waited until Brooke was asleep to slide it under her pillow. A couple of months ago, a reader spotted this on a local exchange site. She sent me the seller’s information; I contacted him, and he agreed to ship it to me. I bought it two minutes later. Ever since its arrival, it’s been tucked away on a shelf waiting patiently for Christmas. As I type, it sits on Brooke’s dresser. Bathed in the glow of her fish tank, it looks kinda magical. Which, I suppose, is exactly what it is. It came from the Tooth Fairy after all. Ed note: Thank you SO much to the reader who made this possible. The Tooth Fairy is very, very grateful for the assist. Yes, I really did share that with you. LOVE!!!!!!!!!!!!!!!!!!!!!! This was a magical post (sans the disturbing TF image at the end :-)). I love every bit of this story. It’s all magical. Nice save. And don’t beat yourself up over not knowing about the tooth. I once discovered Ryan had lost a tooth when I found the tooth on the bookshelf in our living room. He didn’t even mention it. Hello dear readers – I NEED one of those Teletubbies waterglobes if there is another one to be found on planet Earth! 🙂 And if anyone needs a pair of brand-new size 4 custom painted Tinky Winky leather adidas from the now-defunct NYC Teletubbies shop, I’m your girl! That tooth fairy sure is magical! http://www.polyvore.com/amazon.com_teletubbies_big_hugs_snow/thing?id=49912257#cs. Best I could find, though the price is just silly. Ebay has two of them! Just type Teletubbies snowglobe in the search engine and they pop right up! I love reading about your daughter because my girl does some of the same things and it’s just nice to know there are other little girls out there that are a lot like her and that she’s not alone! She also, until recently, insisted the that the Tooth Fairy brought gifts. We told her she had to write the tooth fairy a note asking for what she wants and the tooth fairy would bring it the next night. It at least bought us a day to shop! I’m glad the tooth fairy was able to come to your house and leave such a wonderful prize for Brooke! Seriously, though, so glad that the magic came through. Love it. I love this!!!! My son at age 12 is exactly in the same belief bracket ad Brooke! Not having any excuses about the tooth fairy. Not until just recently have we slowly made the transition from toys from Miss Fairy to money. This is only because he now knows if a store that sells a favorite snack of his …Andy Capps Cheddar Fries!!!! He will very happily take a jaunt to this store and trade his money for those. 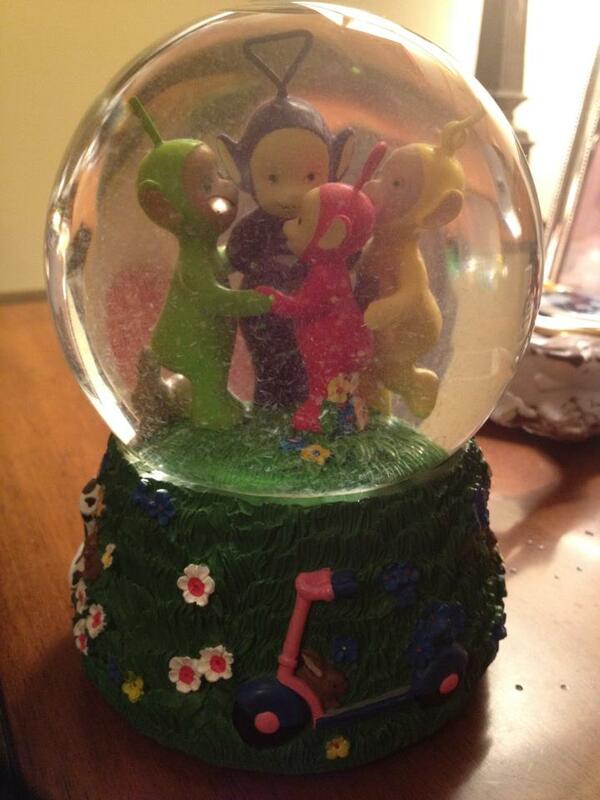 And the teletubbies snow globe, well he loved those freaky little characters for years and years!! I love that no two kids on the spectrum are the same but boy oh boy their likes and things that attract their attention can be right on target with each other!!! Gotta love that tooth fairy!! So glad Brooke got such a great gift! Everyone should BELIEVE!! So magical…I have been struggling so with this loosing teeth thing with my girl recently. Se is only 5 so the first one freaked us out when we noticed it leaning to the side. She did not seem to notice…I followed her around watching …but yet I STILL missed it. She swallowed it.then I warned her teachers at school about the second one…they watched…they missed it. She swallowed it. (my girl puts everything in her mouth so she probably loved this) So the idea of explaining the tooth fairy when there is no tooth…kinda hard! :(. So we let the first one go….the second one we tried money but she didn’t get it. We will try for the next one! Maybe she will notice……. This was magic – good job Mom! LOVE THIS. So brilliant!! And what a GREAT tooth fairy you are! Way better than the tooth fairy that “visits” our house. ~LOL~ We are fortunate though. Our Gab’s “kind of” understands money… And she loves finding the money surprise under her pillow. Helen lost her molar Tuesday night. I too did not know it was loose. We were walking into the Y when I noticed something in her hand. “Helen, what do you have in your hand?” she non chalantly replied “a tooth”. I might’ve overlooked the ghastly image at the end of the post because of the dust motes in my eye…or something. 😉 Smart cookie, your Brooke; the tooth fairy is less abstract than Santa, I think. Much more direct cause-effect relationship than Christmas.